Good news for meat-lovers and cosmopolitan foodies – we found an Afghani restaurant in town! If your heart (and taste buds, of course) crave cuisines which cross all man-made borders, Kabul Kolkata at Park Circus is a place you should not miss out on. They serve authentic Afghani cuisine, which is whipped up by chef Gul Mohammad- an Afghan from Kabul. 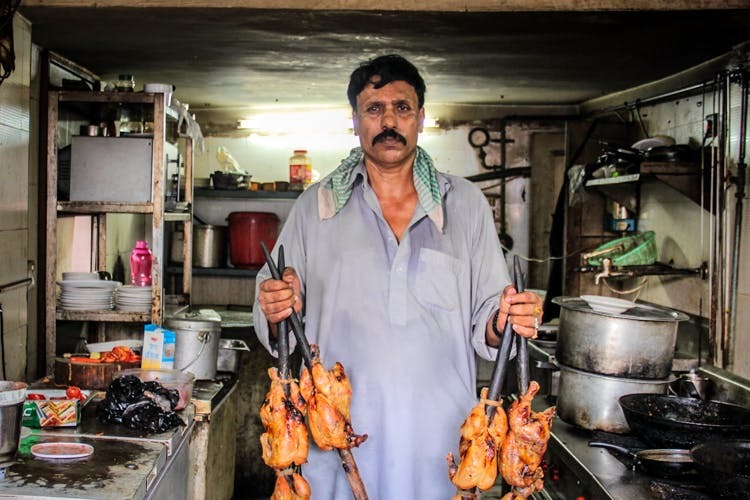 If you dig around a little, you will find that the previous owner Nawab Khan (a man from Kabul) aimed to bring the flavours of his native land to a city which has a history of sheltering Afghan immigrants during the British rule. Kabul Kolkata is the first of its kind, to serve the cuisine of Afghanistan, which is cooked in the most authentic and traditional ways by Afghan chefs. Nawab Khan sold the property to Hasan Khan, who now owns it. The décor and presentation of the dishes is modest and simple, and if you sit in the ground floor you might even get a glimpse of your orders being cooked. The menu left us spoilt for choice- and for meat-lovers, Kabul Kolkata is paradise right here in the city. Our favourites from the menu is the Afghani Naan (which is so huge that it can be easily shared by three people!) and the creamy and spicy Afghani Murg Handi for INR 60 and INR 250 respectively. You must also try the Kabuli Pulao (INR 150) which consists of rice, veggies and a succulent piece of lamb. Kabul Kolkata is known for cooking tandoori dishes in an actual tandoor (clay oven). But fair warning - the servings are pretty loaded, so an adequate appetite is a must. Head to this little gem next time you are in the mood for something new, especially late at night. Most of the dishes are cooked and flavoured without (or with very little) oil. And it remains open from 6 in the morning to 12 at midnight.